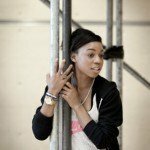 At the time of the interview Pippa Bennett-Warner was appearing in Shakespeare’s Richard II at Donmar Warehouse. “Michael Grandage… is such a hero of mine! Working with him and at the Donmar this time round feels like I’ve come home”. Since graduating from RADA Pippa has appeared on television and made her stage debut as Young Nala in The Lion King. She starred as Denise in The Swan at the National Theatre and then played ‘Cordelia’ in the Donmar production of King Lear, opposite Derek Jacobi. Earlier this week Pippa took some time out from her busy schedule to answer some questions about herself and her career. You were born under the star sign of Leo, “generous and warm-hearted, creative and enthusiastic, broad-minded and expansive, faithful and loving”. Are you a typical Leo? After reading that I hope so! At what age did it become apparent that you had a talent for acting? Acting came after singing (which was my first love), I always sang, like always, I think I drove my parents mad! It wasn’t until after I did The Lion King that I decided that maybe straight acting could be fun. Did anyone in particular inspire you to be on the stage? To be honest I think my sister did. She has gone into a different part of the industry now but when we were younger I always wanted to do what she did. She is three years older than me and one Christmas at prep school (it was an all girls school) she played the role of Oliver and I remember thinking “ooh I’d love to have a go at that”. You graduated from the Royal Academy of Dramatic Art last year, what do you recall of the time when you gained a place there, and what are some of your favourite memories from your time at RADA? I was supposed to graduate from RADA in 2009 but didn’t end up taking my place due to getting my role in ‘Caroline or Change’. The first year of getting in was a lovely feeling but also slightly nerve-wracking as I had just been offered the role at the National. The following year my parents literally had to force me through the doors for the audition because I’d had a change of heart and decided that I didn’t want to go, but in hindsight I’m so glad I did. RADA helped me to develop as an actress and also as a person, it was great going from a very safe environment like boarding school to suddenly not quite knowing what you’re doing or who you are. I learnt a lot. As well as on the stage you have also appeared on television, making your debut in Holby City. What was it like filming on set and appearing in such a popular TV show? Oh so much fun. It was quite a long time ago but I remember everything about it being very lovely. I really enjoy filming, it requires a different skill which is fun I think. I remember when it was going to be aired, my mum told everyone – all very embarrassing! You have subsequently appeared in several TV programmes. Do you have a preference for performing on stage or television? I’ve done more stage than TV so at this point I’d say my heart is with the stage. However I’m hopefully going to take a break from the theatre after Richard II and concentrate on doing some TV and film as they are mediums that really excite me. When did you make your professional stage debut and how would you describe that experience? I was cast in the original ‘The Lion King’ when it first came into town as ‘Young Nala’, it was amazing! I think at the age of 11 it felt like all of my dreams had come true. It was an open audition and I went through something like 9 auditions so when I got the job I was completely ecstatic! I remember it being quite tough/challenging but super fun. Playing ‘Nala’ was what kick-started my love of acting and the role was great. I was brought up on Disney films so to be involved in a Disney musical was fab. You recently starred in ‘The Swan’ by DC Moore at The National Theatre. Can you tell us about your role and appearing at the NT? I played the role of ‘Denise’ which Dave had written for me, which was wonderful and terrifying at the same time as I really wanted to do it justice! She was a young girl from Stockwell who on the day of her step-father’s funeral had abandoned her mother in the church in order to go and find her step-grandfather. To cut a long story short things get revealed and she learns things about her family and ultimately she forgives the betrayal of someone she loves. It was a really meaty role. I loved it and her. It was my second job at the NT and it was awesome, I love the idea of being in a building where you’re not the only play that’s on. When you performed as ‘Cordelia’ in the Donmar’s production of ‘King Lear’ you had “rave reviews”. What was so special about that role for you? Playing ‘Cordelia’ was absolutely amazing and playing opposite Derek Jacobi was so wonderful and I think one of the reasons why that role feels so special to me. Working with Derek and Michael Grandage made embodying her as easy as I could have hoped for. She is such a heroine! She’s feisty, strong and independent whilst being totally devoted to her father. I think every actress that has played ‘Cordelia’ falls in love with her, it’s hard not to. You are starring as ‘Queen Isabella’ opposite Eddie Redmayne in ‘Richard II’ at the Donmar Warehouse. How do you make the role your own? Before rehearsals started I read a few reviews from past ‘Richard II’s and I think the main thing I’m trying to do is to give her a strong (er) voice. Eddie and I decided that Isabel wears the trousers from time to time in their relationship so that’s been something that’s been fun to play with. Every time we see her she’s receiving bad news, she’s totally powerless within the world of the play, so trying to toughen her up a bit whilst maintaining her loneliness and vulnerability have been my priorities. Why should everyone go and see ‘Richard II’? Everyone should definitely come to see it because everyone is doing such great work and it looks so beautiful. The set is fabulous. It’s amazing to see how it’s all come together. Do you have a favourite Shakespeare play that you would love to appear in? I don’t really have a favourite play, but I would love to have a go at ‘Juliet’ or ‘Isabella’ in ‘Measure for Measure’. What is it about the Donmar that makes it so special for you? Michael Grandage. He is such a hero of mine! Working with him and at the Donmar this time round feels like I’ve come home. ‘Lear’ was such a long and glorious job that returning this time feels like a cherry on top of an already beautifully iced cake. Is there anyone that you would really love to appear on stage with? What do you like to do when you chill out and are not working? I am fashion obsessed. I have this blog which I started when I was doing King Lear where I ‘pimp’ people’s dress sense, pimp meaning ‘to upgrade someone’s style’. It started off as something to entertain me on our days off in Llandudno, for example, but it’s a lot more serious now. So most of the time when I’m not working I’m dragging people round shops or writing! What message would you like to say to your fans and supporters? Thank you so much for your support and please do come see Richard II! Many thanks for the interview Pippa and best wishes for Richard II and the future!